Photo by Alexander Woodard Kaitlyn Hernandez taking part in singing spiritual and ceremonial songs with the group of protesters staying overnight. photo courtesy of Unified Students of Humboldt hundreds of students showed up on the university quad in october to protest the firing of indian native resources, science and engineering program director Jacquelyn Bolman. Photo by Alexander Woodard The group of protesters occupying the Native American Forum at Humboldt State University comes in for a group hug and to give each other words of support. Photos by Alexander Woodard Gregory X. Rodriguez, left, and Alicia Flores, right, compete in their own dance-off after the group had finished singing spiritual and ceremonial songs. 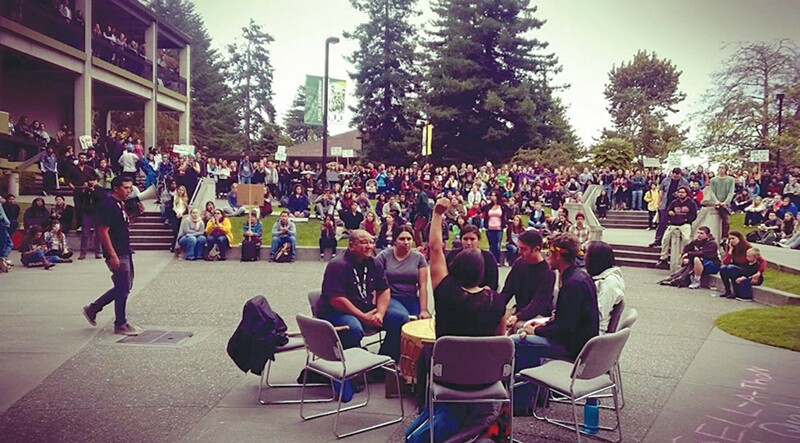 photo courtesy of Unified Students of Humboldt Students, alumni and community members, known collectively as “Unified Students of Humboldt,” took up residence in HSU’s Native American Forum for 35 days before suspending their sit-in as a show of good faith and entering mediation sessions with campus administrators. 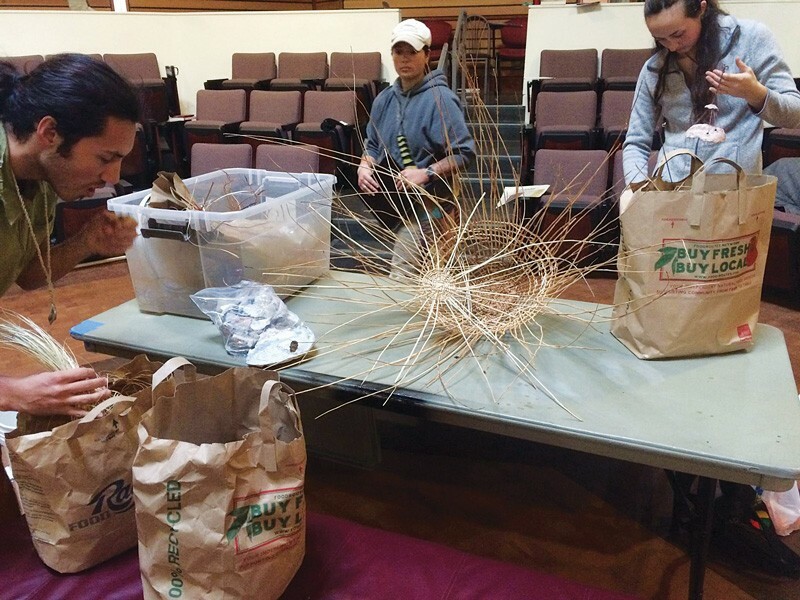 photo courtesy of Unified Students of Humboldt Community members dropped off basket-making materials so Unified Students residing in the Native American Forum could learn a traditional craft. The room is quiet. It's 9 a.m. on a day in late January and students are spread out across the stadium seating of the Native American Forum at Humboldt State University. The smell of burnt coffee wafts through the air as they listen to an instructor discuss last week's reading. It's almost like any other second week of class, except for the small group of protesters who sit along the outskirts of the forum. A few days later, all instructors were officially banned from holding classes in the space due to administrators' concerns over "some faculty and students who were uncomfortable and intimidated by the educational environment in the room," according to a university press release. But those protesters would remain in the forum for weeks — 35 days in total — before suspending their sit-in sometime after midnight on Feb. 23, and, as a show of good faith, committing to mediation sessions with HSU President Lisa Rossbacher and other administrators beginning March 3. "We all got together and, on the advice of our elders, we decided to leave the forum to show that we are coming to mediation in a peaceful manner," said Michael Ramirez, a junior ethnic and American studies major. "[President Rossbacher] has made statements that she wants to include us in the decision-making process and we're taking her at her word. We are leaving the forum in an act of good faith, so we can go into talks without hostility and with clear, rested minds." Exactly what the group — dubbed Unified Students of Humboldt — achieved in taking over the Native American Forum remains to be seen. To date, none of the Unified Students' demands have been met. But it's clear they started a conversation. As students and alumni protesters filed in and out of the forum in recent weeks — subsisting on food donated by supporters, with coffee, tea and water serving as liquid staples — news of their residency in a campus classroom was covered by local news outlets. The protests gave voice to long simmering frustrations among some on campus — frustrations that began to bubble over last October when HSU fired Jacquelyn Bolman, who for nine years had directed the school's Indian Natural Resources, Science and Engineering Program. Some saw the firing of Bolman, a popular and by all accounts dedicated mentor to Native American students on campus, not as an isolated incident, but as just the latest in a long line of systemic assaults on the Native American Studies major and support services for indigenous students that had been going on for more than a decade. On Oct. 9, 2014, campus administrators — under the direction of Rossbacher — informed Bolman that they were ending her at-will contract, effective immediately, two days prior to the start of the 21st annual Indigenous People's Week on campus. She was escorted out of the Indian Native Resources, Science and Engineering Program (INRSEP) house in front of crying students. School officials simultaneously changed door codes and refused to allow students into the building. The firing set off a series of protests — "the largest the campus has seen since Vietnam," according to Conor Handley, one of the organizers of the Unified Students of Humboldt. Hundreds of students walked out of class one Tuesday and flooded the campus quad, where there were drum circles and impassioned speeches. Students described Bolman as a mentor and an ally, someone who cared about them and their educations. Shenae Bishop, a 23-year-old HSU alum, was one of the Unified Students taking up residence in the Native American Forum. She said she was there, in large part, to support Bolman, who helped her when she showed up at INRSEP, a unique academic and research program that seeks to integrate indigenous people's traditional knowledge with the Western mainstream approach to science. "I was embarrassed to be a theater arts major around a bunch of science students," she said. "But Dr. Bolman told me, 'Science is art and art is science. Science needs art and creativity to find answers.' In the first five minutes of meeting Dr. Bolman, she helps you see a bigger picture of yourself." 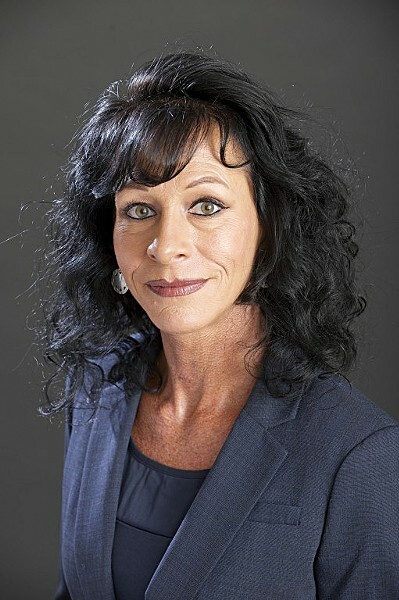 Bolman, who identifies as Oglala Lakota and worked at NASA prior to arriving at HSU, received national attention for her work, winning the Professional Mentor Award from the Society for Advancement of Hispanics/Chicanos and Native Americans in Science in 2013. That same year, HSU also appointed her to direct the university's newly created Center for Academic Excellence in science, technology, engineering and mathematics (STEM) disciplines, tasking her with overseeing all underrepresented students. Bolman initially agreed to an interview for this story, but then did not return numerous calls and emails from the Journal. School officials cannot disclose the reasons behind her firing due to personnel privacy laws, but eyewitnesses and internal emails — acquired through the California Public Records Act — show that administrators were concerned by her comments in a report filed shortly before she was fired. As a part of her duty on campus, Bolman filed an annual report to the California State University Louis Stokes Alliance for Minority Participation, a funding program geared toward increasing the number of underrepresented students in STEM programs. In her last report while on campus, Bolman wrote, "The HSU administration has not been supportive of (the school's minority populations)." As evidence, Bolman pointed out that "the school's under-represented student population is currently at 29 percent, while under-represented minority faculty and staff only account for 12 percent of the school's full-time staff, compared with 42 percent for the Cal State system as a whole." Bolman's supervisor, Radha Webley, wrote to Dean of Research and Sponsored Programs Rhea L. Williamson, noting the information not only reflected poorly on HSU, but was also "simply untrue." The emails show that administrators took umbrage at what they saw as Bolman putting future grant funding in jeopardy. At the time of Bolman's report, HSU was in the hunt for portions of a California State University system-wide $4.6 million grant initiative to support STEM programs for minorities on at least eight campuses. In an email, Williamson summed up the situation as follows: "Dr. Bolman sent the attached report to a federal agency. The report makes very disparaging remarks against HSU and for totally unclear reasons, against me. This language was sent to a federal agency that provides funding opportunities such as (Louis Stokes Alliance for Minority Participation), the (Hispanic Serving Institutions) program, etc. ... It is really unfortunate language used in that this type of reporting can affect our ability for future funding." School administrators filed a petition to have Bolman's statements redacted from official reports. Two weeks after firing Bolman, HSU announced it was one of eight campuses to receive part of the $4.6 million STEM programs grant. "Grants are political currency on campus," said Joseph Giovannetti, a professor in the Native American studies department. "You get points and accolades for getting grants. Money coming to the university is what matters." To hear protesters tell it, Bolman's troubles began in in the summer of 2013, when her Indian Natural Resources, Science and Engineering Program was moved from the purview of HSU's College of Natural Resources and placed under the Office of Retention and Inclusive Student Success (RISS), which is directed by Webley. 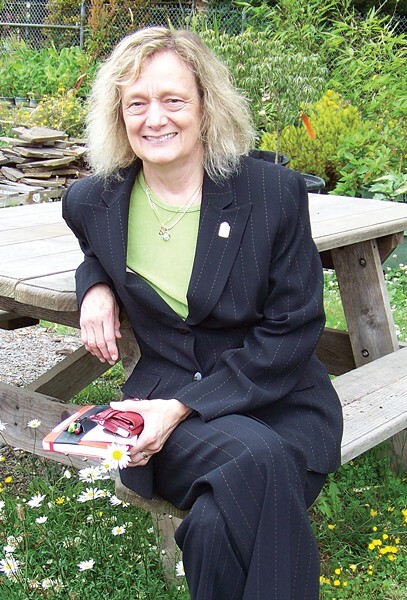 Handley, one of the organizers of the sit-in, said Bolman received nine years of exemplary reviews from her supervisors before coming under Webley's supervision. Then, Bolman received poor reviews, according to Handley, who said Bolman showed him and a handful of other students her reviews as proof the administration was out to get rid of both her and INRSEP. Moving the 40-year-old INRSEP came as part of a large restructuring plan by the university. As Webley explained, it was the best way to organize student support. She said similar services provided by programs in different departments often overlapped, and students could find themselves getting advice from three different areas, each offering different solutions and direction. But it's this ongoing restructuring that Bolman, and many protesters, resented. Bolman's report mentioned the move, which she said came with a "significant reduction in funding,"
Sarah Caligiuri, a Native American studies major, put that reduction at roughly $40,000 and said INRSEP has been reduced to a student club. "Every time our programs get transferred we lose funding, staff and parts of our identity," she said. "In spring 2014, INRSEP students looked at the budget and saw discretionary funds were missing." Technically, the funds were not missing. When the program was placed in Retention and Inclusive Student Success, it was no longer eligible for discretionary funding provided by the College of Natural Resources and Sciences. Webley said the $40,000 was a one-time allocation and that the base budget actually went up from $157,577 in the 2010-2011 budget to $270,071 in 2013-2014. But because the $40,000 was discretionary funding to be used on field trips, attending conferences and other activities, and the base-budget increase largely went to staff salaries and benefits, the perception among protesters was that INRSEP lost funding in the move and that Webley actively worked to have Bolman fired. When protesters initially released their demands, the firing of Webley and the dissolution of RISS were high on the list. For her part, Webley feels she's been wrongly singled out. "Students are looking for someone to hold accountable and as [Bolman's] supervisor, I became the target," she said. "I understand the impulse to blame someone, but it's just not justified." In recent years, HSU has worked to raise its population of traditionally underrepresented students. In October 2013, it qualified as a "Hispanic-serving institution" — a university with an undergraduate full-time enrollment of at least 25 percent Hispanic students. The following year, the school's Wildlands Resource Department announced it had received a four-year, $1 million grant from the U.S. Department of Agriculture to increase the enrollment and retention of Hispanic and other underrepresented students in forestry, range and soils at HSU. In an email to the Journal, HSU spokesman Frank Whitlatch said, "Efforts to increase diversity are embedded within our recruitment strategy. We also take part in various CSU system initiatives to better reach out to, and serve, under-represented communities." Part of the school's strategy includes two full-time recruiters based in the Bay Area and Southern California, as well as international recruiters who travel overseas, including to China. A 2014 enrollment report found that, between the fall of 2012 and the fall of 2014, the enrollment of Latinos on campus increased 35 percent, Asian-American enrollment rose more than 18 percent and the university's African-American population rose by 10 percent. But has the school's focus on the recruitment of traditionally underrepresented students, which qualifies it to apply for bigger federal and state grants, come at a cost to local indigenous students? Several of the United Students pointed out that, while HSU sends recruiters to several foreign countries, it does not have anyone dedicated to recruiting indigenous students. Records from HSU's 2004-2009 Strategic Plan and from the Office of Institutional Research and Planning show that under President Rollin Richmond (whose tenure ran from May 2002 through July 2014), the population of self-identified indigenous students fell nearly 60 percent, from 199 down to 83. During the same time, HSU's enrollment doubled, from roughly 4,000 students to 8,000. 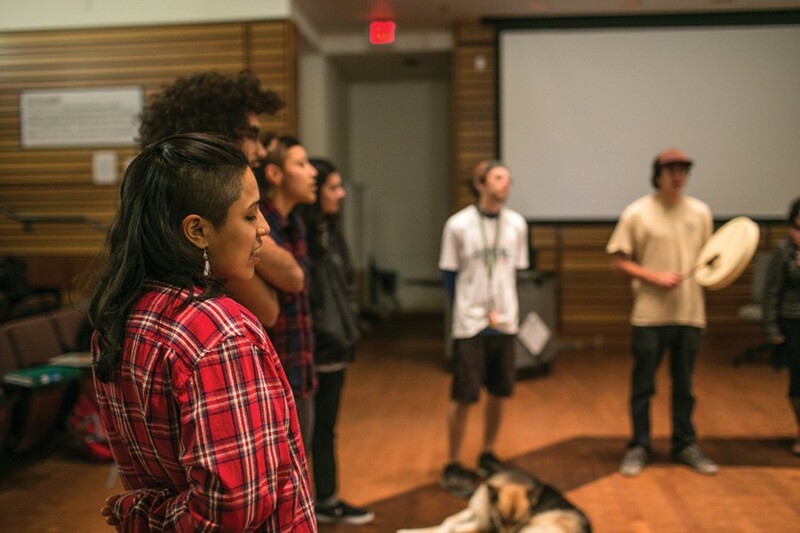 Where indigenous students used to make up 5 percent of the population on campus, they now account for only 1 percent. Webley said those numbers are a bit skewed due to a change three or four years ago in the way students are counted by the state and may not be indicative of the true number of indigenous students on campus. However, the downward trend is still visible, even when using numbers prior to the change. And it's not just student numbers that are down. Giovannetti, the Native American Studies professor who entered the Faculty Early Retirement Program this year, said in 2003 there were 4.5 full-time professors. "Since then I think we have only had the equivalent of 2.4," he said. Giovannetti also pointed out that funds from the Native American studies budget are currently being used by administrators to pay the salary of a professor in the anthropology department. Currently there are 12 courses being taught by four adjunct faculty, also known as part-time or contingent instructors. "They make about 30 percent of what a professor earns," Giovannetti said in an email to the Journal. "Using adjuncts is no substitute for having permanent, tenure-track faculty. The administration never followed through on the promise to hire two tenure-track faculty in 2003. It took two years before Marlon Sherman was hired tenure track. Then [a provost] got a case of amnesia after promising that the [Native American studies] department would receive another tenure-track position during the 2004-2005 academic year. It never happened. It is very much like the history of Indian treaty promises. All broken." But tensions between Native American groups far predate the administration of Rollin Richmond. One could argue they stem back a century, to when Humboldt State College was built on what used to be Wiyot land. The university's relationship with local tribes has also been rocky at times. In 2013, HSU closed its Center for Indian Community Development, which had been established in 1996 to provide services and outreach to Indian communities on behalf of the university. That same year, the Northern California Tribal Chairmen's Association — a group made up of leaders from 11 tribal nations — protested on campus after administrators failed to implement the recommendations of a tribal working group. The 12-person group — split evenly between tribal members and university officials, all appointed by Richmond — spent two years crafting its recommendations, which included the creation of a tribal liaison and enhanced Native American recruiting efforts. In a 2013 press release, Yurok Chairman Thomas O'Rourke Sr. said, "HSU President Richmond flat out ignored the work group's reorganizational plan and recommendations. This plan would have greatly increased our students' ability to succeed, at a time when Native American enrollment at the university is in a freefall because of how it treats indigenous people." During a recent interview with the Lumberjack newspaper, Richmond was asked why the university denied the group's final recommendations. His reply was to partly blame the indigenous community. "In part, I think it was a consequence of differences between the tribes themselves," he said. "They rarely fully agree with each other, and also there are particular political needs of some individuals." To protesters, the university's decision not to implement the work group's recommendations was reminiscent of its funding and then ignoring a 1989 report by Vine Deloria Jr., which called for sensitivity classes for all majors and a full-time Native American recruiter. Sitting in the Native American Forum, Handley said it's clear indigenous people are being marginalized on campus and have been for some time. "We're in the middle of the highest population of native people in California, in the state with the most ... native people in the whole country," he said. "Humboldt State should be the premier institution for Native Americans. Instead, they're leaving. They don't want to leave, but they don't want to deal with the trauma of dealing with HSU." 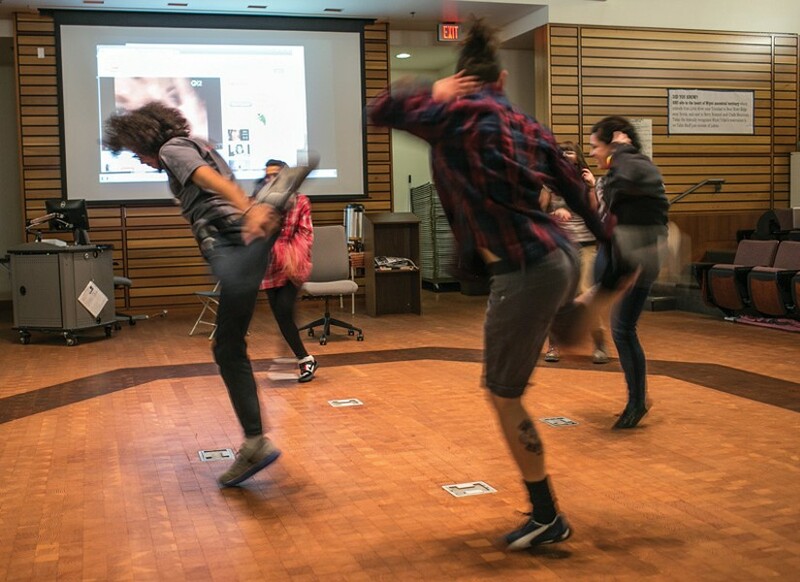 But it's not only indigenous students who feel they have been marginalized on campus. Naomi Waters, president of the Black Student Union, pointed out that February was Black History Month, yet "no one in the administration, [student government], not even the Office of Diversity and Inclusion, have any planned activities to celebrate the month." More relevant to what transpired at the Native American Forum, Waters said she is still upset about losing her adviser, Dr. Steven Bell, last year. "We still don't know what happened," she said of Bell, who worked in the Office of Diversity and Inclusion under Webley. "He was asked to leave the week before school ended. He was the reason I got involved with school activities. He was one of the few people to give me answers I knew to be true." Bell was also the adviser to F.R.E.E., a school club dedicated to the retention and graduation of low-income and undocumented students. In addition to Bolman and Bell, the university also dismissed two staff members who Handley said were vocal advocates and mentors. "Grace Cardenas was a big loss to the Asian community — they're still mad about it," Handley said. "They also fired Antonio Lopez, a librarian who was organizing a scholarship for undocumented students with F.R.E.E." Cardenas, who was the director of the Centers for Academic Excellence, was also supervised by Webley. It was against this backdrop that a group of students, alumni and community members gathered Jan. 18 and 19 for a Native American Activism Conference in the forum. 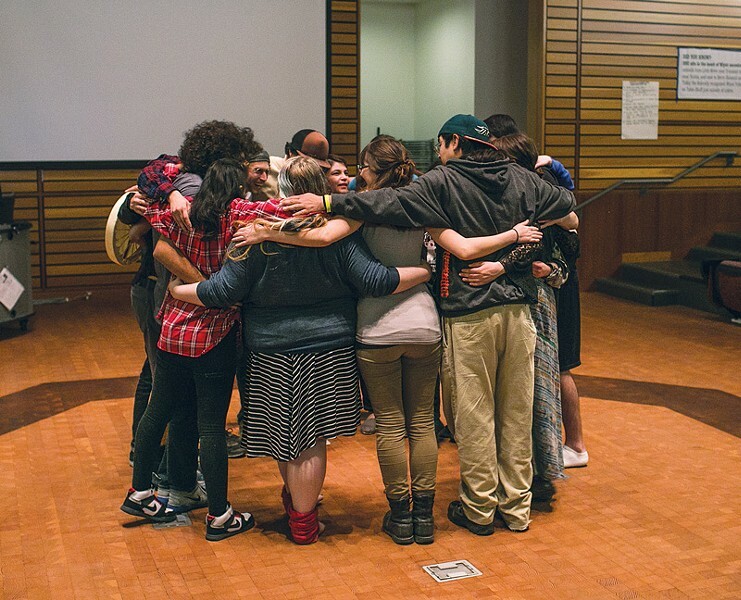 After two days of speakers and workshops, the Unified Students of Humboldt announced they weren't leaving and renamed the space the Dr. Jacquelyn Bolman Forum. A 35-day standoff ensued. Administrators said they respected the group's right to protest and assembly, but rescheduled classes away from the forum. President Rossbacher, who declined to be interviewed for this story, twice met with protesters, pledging to work with them to address their concerns. Though the Unified Students were in violation of school policy, exposing members to disciplinary action and arrest, the University Police Department met with them and refrained from taking action. "We understand that the Native American Forum is a sacred space to [the protesters]," new University Police Chief Donn Peterson said recently. "Everyone has been very peaceful and respectful. People lose sight of why we're there. My job is to protect life and property, but the question is, 'What are we doing to protect students and their constitutional rights?'" Peterson said his staff includes two officers of indigenous descent who work with local tribes. "I have a support group that keeps me grounded and helps me make good decisions," he said. "We need to be understanding of the deeper issues." Michael Ramirez, the ethnic and American studies major who has spent much of the spring semester in the forum as a part of Unified Students, said the group could have held the space — occupying it, liberating it or simply residing in it, depending on who you ask — for months. "It wasn't that hard," he said, likening it to summer camp and noting that protesters woke up every morning to traditional Native American songs. The group had plenty of food donated from the community, he said, and planned carefully to make sure all protesters made it to class and got plenty of sleep. "Besides missing my cat, we managed to be very comfortable and we've left the forum the way we found it." But the group decided to take a step back, having taken Rossbacher, who took over as HSU's president at the beginning of the school year, at her word that she is committed to working with them. The group's demands are clear and, if all else fails, Ramirez said coming back to the forum is an option. And if life on campus simply returns to normal and the protesters don't get their demands met? Handley said the group will still have left a mark. "Every single person involved will remember this for the rest of their lives and (it will) inspire them to be activists and get involved," he said. Or, in Ramirez's words: "It wasn't a sacrifice, but an investment." J. Daniel Fernandez is a freelance journalist living in Eureka. Be the guiding light for other CSU systems to comport themselves with. Negotiate with us and participate in open dialogue in regards to these demands with a mediator present. Those who profess to favor freedom and yet depreciate agitation, are people who want crops without ploughing the ground... The struggle may be a moral one, or it may be a physical one, or it may be both. But it must be a struggle. Power concedes nothing without a demand; it never has and it never will. 1. Reinstate and secure Dr. Jacquelyn Bolman's position as Director of INRSEP.